LAS VEGAS (AP) — Don’t tell Vegas coach Gerard Gallant the rest of the regular season is meaningless. Though the Golden Knights already became the seventh NHL team to make the playoffs in each of its first two seasons, Gallant insisted the final three games mean plenty to them. With third place in the Pacific Division and a first-round playoff date with San Jose already locked up, Vegas ended a five-game losing streak. The Golden Knights won the season series 3-1, outscoring Edmonton 15-9. 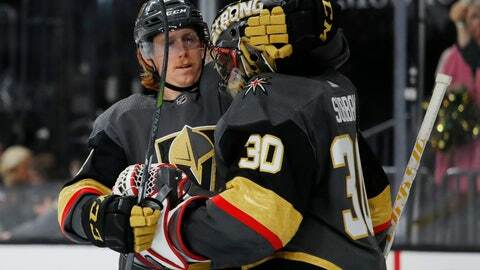 Cody Eakin and Pierre-Edouard Bellemare also scored for Vegas, which is 11-4-2 since the trade deadline. Malcolm Subban stopped 18 shots while making his ninth straight start in place of Marc-Andre Fleury. Subban ended an 0-3-2 skid since earning his first career shutout on March 21 and has a 2.67 goals-against average during the nine-game span. Eakin gave the Golden Knights a 1-0 lead early in the first period when he gathered the puck just outside the blue line, skated to the top of the right circle and roofed a wrist shot past Edmonton goaltender Mikko Koskinen. Marchessault’s eventual game-winner came 51 seconds into the second when he poked the puck away from Leon Draisaitl in the defensive zone, broke free alone and beat Koskinen with a backhand between his legs to make it 2-0. Marchessault has scored a point in 17 of his last 26 games, with eight goals and 15 assists. Koskinen made 28 saves and Connor McDavid tied a career best with his 41st goal for Edmonton. McDavid was left alone in the right circle, received a pass from linemate Zack Kassian and fired a wrist shot through Subban’s legs to make it 2-1. Bellemare’s empty-netter provided the final margin. NOTES: Vegas RW Reilly Smith celebrated his 28th birthday. … With his assist on Bellemare’s goal, William Karlsson has scored a point in 11 of 15 games, with six goals and 11 assists. Karlsson is two shy of 100 career assists … Fleury was scratched again and remains day-to-day with a lower-body injury. … McDavid, who ranks second in NHL scoring, 11 points behind Tampa Bay’s Nikita Kucherov, has a career-high 115 points this season. McDavid has also set a career best with 74 assists. Oilers: At the Colorado Avalanche on Tuesday. Golden Knights: Host the Arizona Coyotes on Thursday.